Cameron at Calvary Baptist Church in Manhattan, May 5, 2007. Kirk Thomas Cameron (born October 12, 1970) is an American actor best known for playing "Mike Seaver" on the television situation comedy, Growing Pains, and in other television shows and movies. He was the main actor in the Left Behind movie series and in Fireproof. He is also an active Christian evangelist, and works with Ray Comfort on The Way of the Master. He co-started The Firefly Foundation with his wife, actress Chelsea Noble. Cameron was born on October 12, 1970 in Panorama City, California. His parents are Robert Cameron, a retired school teacher, and Barbara Bausmith, a stay-at-home mom. He is the brother to Bridgette, Melissa, and Candace Cameron, who is played "D.J. Tanner" on the television sitcom, Full House. He would go to school on the set of Growing Pains, as opposed to a normal school. He graduated at age 17 with high honors. Cameron and his wife, actress Chelsea Noble, were married on July 21, 1991. They now have six children, four of whom were adopted: Jack (born 1996), Isabella (born 1997), Anna (born 1998), and Luke (born 2000); and two biological: Olivia Rose (born July 18, 2001) and James Thomas (born April 13, 2003). Cameron as a young adult. Cameron began acting at the age of nine, and his first job was for a breakfast cereal. His first starring role was at the age of ten in the television series Two Marriages. At this age, he appeared in several television shows and movies. He became famous after being cast as "Michael Seaver" in the 1985 television series Growing Pains. In the series, Seaver's girlfriend was Kate MacDonald, who was played by Chelsea Noble, Cameron's future wife. Cameron subsequently became a teen heartthrob in the late 1980s, while appearing on the covers of several teen magazines, including Tiger Beat, Teen Beat, 16 and others. At the time, he was making $50,000 a week. He was also in a 60-second Pepsi commercial during Super Bowl XXIV. Cameron went on to star in many movies, for example 1987's Like Father Like Son, which made a lot of money. His next movie, 1989's Listen to Me, did not make very much money. When Growing Pains ended in 1992, Cameron went on to star in the sitcom Kirk which began in 1995 and ended two years later. In Kirk, Cameron played Kirk Hartman, a 24-year-old who has to raise his siblings. Cameron and Noble also worked together on Kirk. Ten years after Growing Pains ended, was a part of The Growing Pains Movie, in 2000, and Growing Pains: Return of the Seavers, in 2004. Cameron has also often worked in Christianity-related movies, among them the post-Rapture movies Left Behind: The Movie, Left Behind II: Tribulation Force, and Left Behind: World at War, in which he plays Cameron "Buck" Williams. Cameron's wife Noble also starred in these movies, playing Hattie Durham. Cameron has worked with Cloud Ten Pictures, and has been in several of their movies. He was also in Fireproof, which was made by Sherwood Pictures. They only spent $500,000 making the movie. Cameron as the main actor, playing Captain Caleb Holt. Though it was a did not cost much money to make, the movie made $33,415,129. Cameron said, "[Fireproof is] the best work of my life." "It’s a lot less crazy of a time than when we were teenagers. It’s an opportunity to begin new friendships as adults, and I’m really looking forward to that." Cameron currently partners with fellow evangelist Ray Comfort, training Christians in evangelism. Together, they founded the ministry of The Way of the Master, which is best known for its award-winning television show Cameron co-hosts. It also formerly featured a radio show known as The Way of the Master Radio with talk show host Todd Friel. The radio show was later canceled, and Wretched Radio began, hosted by Friel. He, with wife Noble, founded The Firefly Foundation, which runs Camp Firefly, an organization that gives terminally ill children and their families a free week's vacation. Cameron and Comfort were a part in a debate on television with atheists Brian Sapient and Kelly O'Conner of the Rational Response Squad, at Calvary Baptist Church in Manhattan on May 5, 2007. It was moderated by ABC's Martin Bashir and parts of it were played on Nightline. They debated whether or not there is a God. Some of the people in the audience believed in God, and some did not. ↑ Laufenberg, Norbert B. (June 2005). Entertainment Celebrities. Trafford Publishing. p. 99. ↑ Mansour, David (May 2005). From Abba to Zoom. Andrews McMeel Publishing, LLC. p. 64. ↑ Celizic, Mike (October 18, 2007). "Candace Cameron has 'Full House' of her own". The Today Show. Retrieved February 22, 2009. ↑ "Full House: Cast Listing". TV.com. Retrieved November 27, 2008. ↑ "Just one of the guys". Chicago Sun-Times. November 16, 1987. Retrieved February 28, 2009. I go to school on the set, not to a regular school. ↑ Mills, Bart (August 31, 1988). "Kirk Cameron grows past his early fame as teen idol". Chicago Sun-Times. Retrieved February 28, 2009. ↑ "Kirk Cameron: Summary". TV.com. Retrieved February 23, 2009. ↑ Mills, Nancy (June 26, 1987). 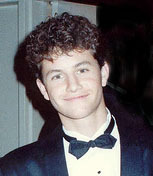 "Curly-Haired Kirk Cameron Teen-Age Heartthrob Takes Fame In Stride". Los Angeles Times. Retrieved February 27, 2009. ↑ O'Conner, John J. (March 8, 1984). "ABC's Two Marriages Now A Weekly Series". The New York Times. Retrieved December 8, 2008. ↑ Rhudy, Ben (January 29, 2009). "Kirk Cameron talks Fireproof, marriage, and the demands of playing a firefighter". Monsters and Critics. Retrieved February 15, 2009. ↑ Kogan, Rick (September 20, 1991). "End of the line Saturday winds up the week with series winding up their runs". Chicago Tribune. Retrieved February 27, 2009. ↑ 12.0 12.1 Slewinski, Christy (May 27, 1996). "'Growing Pains' Pair A Couple Once Again". Chicago Tribune. Retrieved February 24, 2009. ↑ "Will Fall Strategy Keep New Networks Alive?". The Charlotte Observer. August 28, 1995. Retrieved February 27, 2009. ↑ 14.0 14.1 14.2 Ewald, Dan (March/April 2003). "The Rebirth of Kirk Cameron". Christianity Today. http://www.christianitytoday.com/tc/2003/002/1.20.html. Retrieved February 23, 2009. ↑ "Channel Hopping". Dayton Daily News. January 12, 1990. Retrieved February 28, 2009. ↑ "Like Father Like Son Box Office". Box Office Mojo. Retrieved November 26, 2008. ↑ "Listen to Me Box Office". Box Office Mojo. Retrieved November 26, 2008. ↑ Grahnke, Lon (August 23, 1995). "More Growing Pains - Kirk Works On Being Adult". Chicago Sun-Times. Retrieved February 27, 2009. ↑ Johnson, Steve (August 23, 1995). "Up And Running, WB Gets A Jump On Fall With `KIRK'". Chicago Tribune. Retrieved February 27, 2009. ↑ Owen, Rob (November 3, 2000). "On the Tube: 'Growing Pains Movie' catches up with the Seaver clan". Pittsburgh Post-Gazette. Retrieved February 24, 2009. ↑ "Growing Pains: Return of the Seavers : Overview". MSN Movies. Retrieved November 27, 2008. ↑ Lammers, Tim (November 4, 2005). "Film Series Is Something Kirk Cameron Won't Leave 'Behind'". ABC News. Retrieved February 24, 2009. ↑ "Church hosts showing of 'Fireproof' movie". The Herald-Dispatch. January 22, 2009. Retrieved January 23, 2009. ↑ Wilde, Carol (February 16, 2009). "Filmmakers enjoy success of low-budget Fireproof". Video Business. Retrieved February 16, 2009. ↑ "Back of Book Segment". The O'Reilly Factor. April 12, 2006. Retrieved December 8, 2008. ↑ Cameron, Kirk; Ray Comfort (2004). The Way of the Master. Tyndale House Publishers, Inc. Foreward. ISBN 1414300611. ↑ "The Cast of 'Growing Pains:' Where Are They Now?". Fox News. Dec 18, 2008. Retrieved February 27, 2009. ↑ 30.0 30.1 Keck, William (Nov 3, 2000). "TV Family's Cast Gets Over Its Own 'Growing Pains'". Los Angeles Times. Retrieved Dec 8, 2008. ↑ Phan, Katherine T. (February 14, 2009). "Christian Evangelist's Book Ranked Bestselling 'Atheist' Item". The Christian Post. Retrieved February 15, 2009. ↑ "Christian Reality TV Show wins 'Best Program' and 'People's Choice' Awards". Christian Broadcasting Network. June 14, 2007. Retrieved February 24, 2009. ↑ "Wretched with Todd Friel" (PDF). InTouch Ministries. February 26, 2008. Retrieved February 23, 2009. ↑ "'Fireproof' shows Christian movies sell". ABC News. October 3, 2008. Retrieved February 24, 2009. ↑ "Growing Pains Are Behind Him". Sarasota Herald-Tribune. September 13, 1998. Retrieved February 24, 2009. ↑ "Prepare for a Conflict: The Nightline Face-Off No-Holds Barred Battle Over the Existence of God". ABC News. May 7, 2007. Retrieved November 27, 2008. ↑ "The Best of Times". Box Office Mojo. Retrieved February 27, 2009. ↑ "Like Father Like Son". Box Office Mojo. Retrieved February 27, 2009. ↑ "Listen to Me". Box Office Mojo. Retrieved February 27, 2009. ↑ "Left Behind: The Movie". Box Office Mojo. Retrieved February 27, 2009. ↑ "Fireproof". Box Office Mojo. Retrieved February 27, 2009. Wikimedia Commons has media related to Kirk Cameron. This page was last changed on 2 February 2019, at 10:54.